While The People v. O.J. Simpson: American Crime Story has mostly focused on the lawyers for the defense and the prosecution, the FX series hasn't been showing how the jury is dealing with the pressure they're under. That is, until the March 22 episode, "A Jury in Jail," which outlines the "juror revolt" during the Simpson trial. The preview for the episode shows the jury complaining about how long the trial is taking. In real life, these frustrations boiled over with the jurors participating in a "revolt" on April 21, 1995. 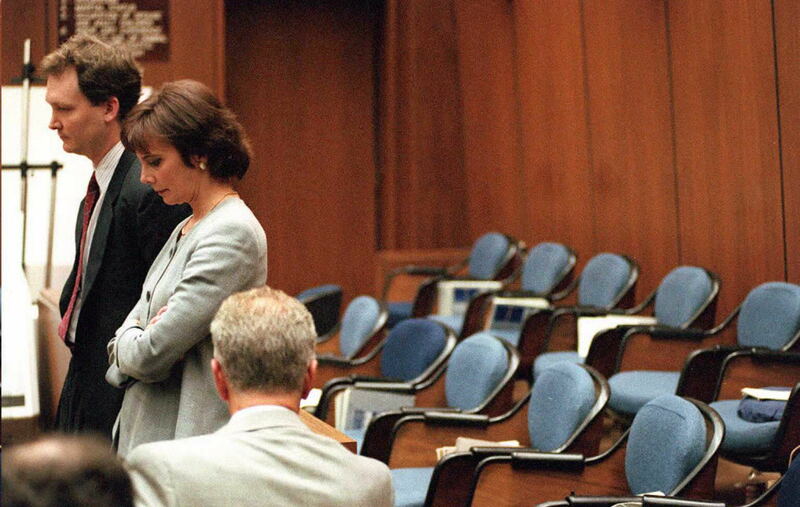 Tensions were high for the jurors, especially since after they were sequestered on Jan. 9, 1995, they were alienated from their loved ones and the public for almost nine months. The revolt was set off by a racial issue that happened behind closed doors — proving that race relations were as tenuous as ever inside and outside of the court during the Trial of the Century. According to a CNN article from 1995, the revolt occurred after juror Tracy Hampton spoke to Judge Lance Ito about how she felt that her privacy was being violated by three deputies who were supervising the jury while they were sequestered. (Hampton was later dismissed from the jury after she requested that Ito release her.) This was not the first time Judge Ito had heard accusations about inappropriate behavior from the deputies; The New York Times reported that two weeks prior to Hampton's complaints, juror Jeanette Harris had accused the three white deputies (two male, one female) of showing preferential treatment to white jurors. (After her comments, Harris was dismissed for not disclosing during selection that she had been a victim of domestic violence.) Based on these reports of inappropriate behavior, Judge Ito decided to dismiss and reassign the deputies. However, the repercussions of this decision were not what he expected. The Chicago Tribune reported on April 22, 1995 that 13 out of the 18 jurors (12 jurors and six alternates) came into the courtroom wearing all-black or dark clothing in protest of the deputies being dismissed. The jury, which had been sequestered for 101 days at this point, also refused to continue with the proceedings unless Judge Ito met with them, leading the judge to cancel testimony for two days. From transcripts released from the juror revolt day, The Los Angeles Times reported that jurors of different races said they had never been mistreated by the three dismissed deputies, and that's why they wore the dark clothes in court. While there were additional reports of mistreatment by the deputies, the majority of the jury claimed that this was not true. From the transcripts, one black female juror said in support of the deputies, "As for any discrimination or prejudice, I have not experienced that at all, and trust me, I am the type if I would have felt that way, I would have handled it immediately or I would have confronted somebody." In addition, some members of the jury said they cried on April 20 when they learned the deputies had been reassigned. On the other side of the argument, The Los Angeles Times wrote that Harris, under oath, had alleged several instances in which she saw racial discrimination by the deputies during the sequester, including white jurors having their own gym and better telephone privileges, shopping trips, and choice of movies. Harris also claimed that she'd experienced privacy issues, and that she thought the deputies were searching her hotel room. This concern about privacy had been echoed by Hampton, who claimed in the previously-mentioned CNN interview that,"Our rooms would be searched on a daily basis ... by the deputies who were in charge of us." Hampton also alleged that her fellow jury members alienated her after the deputies were dismissed. Robert Gordon, a jury behavior consultant, told The Chicago Tribune in the aforementioned 1995 article that he believed the jury's reaction was a "symptom of a deeper wound." Gordon said, "The jurors are saying, 'We have rights, too. We have dignity. We're being isolated and abused. Instead of trying Mr. Simpson, you're trying us, and we protest.'" Regardless of the motives behind the revolt, it doesn't change the fact that the Simpson trial became even more of a spectacle because of Judge Ito's decision and the jury's reaction. While Judge Ito took heat from Los Angeles Sheriff Sherman Block for dismissing the deputies without an investigation, it didn't change the judge's decision, and the deputies remained reassigned. And this juror revolt proved just how divisive the Simpson case was for every single person involved in the trial.